The loss of permanent teeth can damage more than your confidence. Tooth loss can make eating painful, affect your oral appearance, and can even cause a loss of jawbone and alignment problems. Replacing missing teeth is not only beneficial for the smile's appearance, it's essential for good oral health. Missing teeth can be replaced with restorative dentistry treatments that improve dental function and oral health. To discover which treatment for missing teeth is right for you, schedule a consultation with Orland Park, IL dentist Kenneth W. Coffey. The following treatments have helped many patients enjoy a restored smile and may be able to do the same for you. Those who are missing one or two teeth often benefit from dental implant treatment. Dental implants can be paired with dental crowns to replace individual teeth, restoring dental function and appearance. 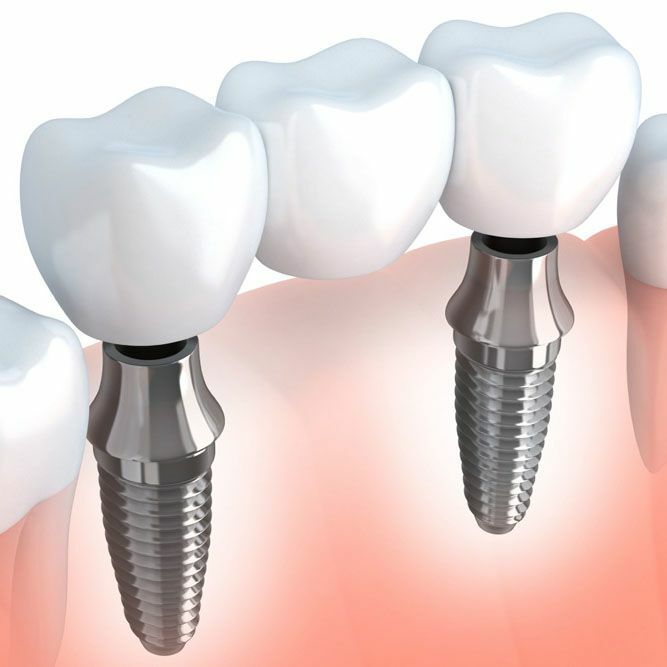 Dental implants are screw-like, titanium posts that are surgically placed within the jawbone. As the jawbone heals around the implant, a permanent bond is formed, much like the natural bond between the jawbone and healthy tooth roots. Once the jawbone has healed and the dental implant is securely in place, a dental crown may be attached to restore the smile's appearance and function. Traditional dental bridges can restore one or more missing teeth without the use of surgery, making this treatment suitable for many patients who suffer from tooth loss. Traditional dental bridges consist of an artificial tooth, called a pontic, sandwiched between two dental crowns. More than one pontic can be placed if multiple, adjacent teeth are missing. For those missing a large number of teeth, dental bridges may be paired with dental implants. Rather attaching the bridge to the remaining healthy teeth, it is attached to dental implants. Traditional removable dentures are a common treatment for those missing all of their upper or lower teeth. Whether one arch or both arches of teeth need replacement, removable dentures can restore dental function and appearance without the use of surgery. Each set of traditional dentures is custom-made to provide a snug, comfortable fit. Implant-supported dentures offer dramatically improved dental function over traditional removable dentures, making them a popular treatment choice for those who require dentures. Implant-supported dentures firmly secure within the mouth by attaching to three or five dental implants. Implant-supported dentures allow denture wearers to enjoy all of their favorite foods in comfort and without fear of their dentures slipping or falling out. Because dental implant treatment requires oral surgery, it may not be suitable for all patients. Candidates for dental implant surgery should be in good general health and able to tolerate surgery. Those who are not healthy enough for surgery, or those who would prefer not to undergo surgery for their tooth replacement needs, traditional bridges and dentures remain effective non-surgical options. To find out which treatment is right for, we encourage you to schedule a consultation with Dr. Coffey.